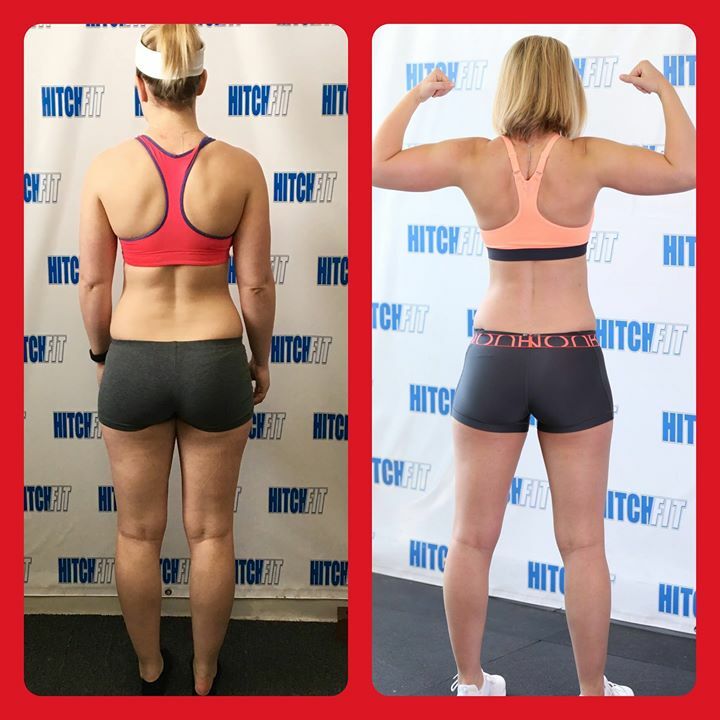 Kansasa City Weight Loss – Lose Weight and Feel Great at Hitch Fit like Caitlin! CAITLIN CAME TO ME AFTER A FRIEND OF HERS HAD STARTED HITCH FIT, WANTING TO GET IN REALLY GOOD SHAPE FOR HER UPCOMING WEDDING. SHE WAS AN ATHLETE, SO I THOUGHT A HITCH FIT TRANSFORMATION WOULD BE A PROGRAM SHE WOULD ADAPT WELL TO, AND THAT IT WOULD COME FAIRLY EASILY TO HER. LITTLE DID WE KNOW…IT WOULD NOT BE EASY! CAITLIN IS PRETTY QUIET, BUT SHE’S ONE OF THOSE “STILL WATERS RUN DEEP” KIND. SHE WORKED REALLY HARD ON HER TRANSFORMATION, BUT THEN ONE THING AT A TIME CAME ALONG TO CHALLENGE THE EMOTIONAL, PHYSICAL, AND MENTAL PSYCHE OF THIS SWEET GIRL! HER WEDDING WAS CALLED OFF, SHE GOT SICK, AND WAS OUT FOR A WEEK OR TWO, AND SHE GOT A CONCUSSION THAT PUT HER AT A STANDSTILL. SOME MAY HAVE GIVEN UP, BUT NOT THIS GIRL! SHE MARCHED ON, DETERMINED TO REACH HER GOALS! I HAVE TO TELL YOU, SHE HOLDS A SPECIAL PLACE IN MY HEART, AND I HAVE SO MUCH RESPECT AND LOVE FOR HER! PLEASE READ HER STORY BELOW. Before I decided to do Hitch Fit, I was attempting to figure out the fitness life on my own. (A.K.A I was being stubborn). I have been an athlete pretty much my whole life. I went to college on a soccer scholarship and I felt as though I could figure this stuff out!! So, when did I give up on thinking I knew everything? Well my best friend would not stop talking about Hitch Fit. She fell in love with everyone’s kindness and how incredibly encouraging they were from the very beginning. At this point I was working my a** off and gaining weight week after week. I felt as though I was doing all the right things, I’ve always eaten relatively healthy and I worked out on average 4-5 times a week. There was just something I was missing in the equation. So two weeks after my friend began her journey with Hitch Fit, I decided I wanted in!! My first day at Hitch Fit, I got to meet Nancy. I had already heard all about her from my friend and her energy was just what I needed. I began Hitch Fit with the goal of becoming fit for my upcoming September wedding. Like all women I needed to make that dress smaller!! J I had been stuck and needed someone who was going to keep me on track with my goals in mind. Working out comes pretty natural to me I had been doing it as an athlete for years. As a soccer player, I’ll be honest; I was use to eating what ever I wanted, whenever I wanted and not gain any weight. Nancy gave me a simple meal plan that was easy to swap different foods in and out to keep things “fresh” and not so repetitive. Between the meal plan and Nancy’s spunky, “go get ‘em” attitude the weight began to fall and the muscle began to grow!! Now, I would be lying to you if I told you transformations are easy. Because let me tell you mine was not!! I ran into a few obstacles, to say the least, during my Hitch Fit experience. Remember when I told you I wanted to make that wedding dress smaller? Well, one of the biggest obstacles to overcome during a fitness transformation is a mental one. Long story short, I called my wedding off and my goals changed a little bit. Now my transformation became a physical and mental transformation. Now for obstacle number two. Being a soccer player my whole life it was hard to quit playing! I still played indoor (even though I had about 6 concussions to date). Well you all know how life is when you start getting the hang of something God throws you another curve ball. I received my 7th concussion playing indoor soccer and won myself a trip to the ED and halted my fitness transformation to a standstill. I could not increase my heart rate at all for weeks, and to this day I can’t go on runs without getting dizzy. It’s a very slow process getting back to normal. Focusing on my diet was key and keeping a positive attitude. I had to add working out back into my lifestyle very carefully. With all that said overcoming mental and physical challenges are all a part of everyone’s fitness journey. With out them you would not be human. The people at Hitch Fit, especially my girl Nancy, were always so encouraging! With out Nancy I don’t think my attitude would have stayed so positive. I wanted to give in so many times, but I didn’t want to let her down she believed in me more than I believed in myself. Nancy became more than just my trainer she is a very good friend that I will have for a very long time. I can’t say enough, I would not have lost 10 pounds or more with out her!! Are you READY FOR YOUR TRANSFORMATION with Nancy Choquette at Hitch Fit Gym in Kansas City?